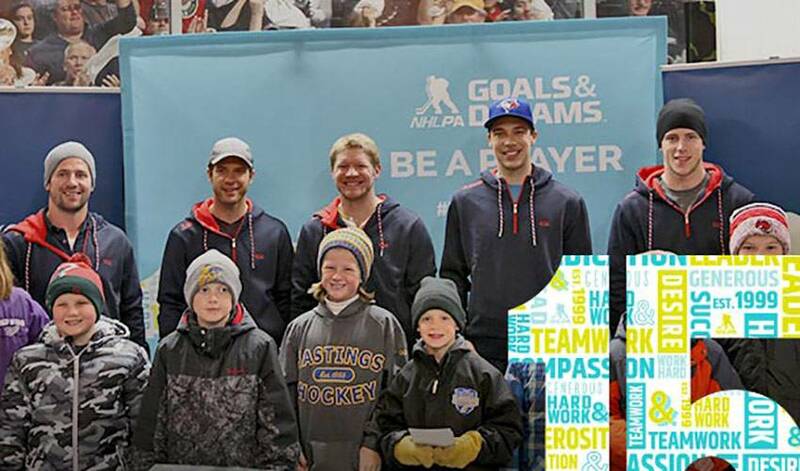 On Tuesday, the NHLPA Goals & Dreams fund celebrated the start of its 15th Anniversary Tour in Hastings, Minnesota. On November 18th, Hastings, Minnesota was in its second week of a cold snap that sent temperatures plummeting - but that didn’t stop 32 excited children and military families from braving the weather to celebrate the game of hockey. To commemorate its 15th anniversary, the NHLPA Goals & Dreams fund kicked-off a multi-city tour with a late afternoon event in the small Minnesota community. Things got underway at the Defending The Blue Line (DTBL) headquarters in Hastings and finished at the Hastings Civic Center. The children broke into three groups in the military-style bootcamp challenges and following, had one-on-one time with Minnesota Wild players Keith Ballard, Darcy Kuemper, Charlie Coyle, Jason Pominville and former NHL player Mark Parrish, before they played a Goals & Dreams Cup hockey game under the guidance of their NHL player coaches. G&D, the largest grassroots hockey assistance program in the world, has contributed over $22 million to grassroots hockey programs and given more than 70,000 children the opportunity to play hockey in 32 countries since being established in 1999. It has worked with many hockey assistance programs in the past, and has a longstanding relationship with the two participating programs in the event - DTBL and Hastings Minor Hockey. G&D and DTBL have worked together on several initiatives, including Tuesday’s event. It’s an ideal association for DTBL, whose goal is in ensuring children of military members are afforded every opportunity to play hockey. Over the last four years, G&D has donated 325 complete sets of gear to their campaigns, including 25 complete sets of brand new sets of hockey equipment that were donated by G&D as part of this event. “It really took me aback, to be honest,” said Joe Harris, President of Hastings Hockey Association, found himself at a loss for words when the 25 boxes of hockey equipment recently arrived at the local arena. The day began outside on the grounds of the DTBL headquarters for bootcamp-style physical challenges that included a National Guard pedal bike track, target practice, and were given the opportunity to try on real military gear. Once the obstacle course was complete, the children and their families headed inside the DTBL headquarters for a meet-and-greet with the NHL players, which allowed the kids to spend some time getting photos and autographs with each of their local hockey idols. During the meet-and-greet, some of the DTBL-supported families that were selected to participate in Tuesday’s event, took a few minutes to share stories from their own experiences made possible by G&D and DTBL. Mike Lubovich, on active duty with the Armed Forces, and his family, who have been involved with DTBL for the past four years for their son, Asher, commented on what the program offers his family. The day wrapped up with a Goals & Dreams Cup hockey game at the nearby Hastings Civic Center. The children were split up into two teams of 16 and faced off for a fun game. Coaches Darcy Kuemper and Jason Pominville coached Team Black versus Team White coached by Keith Ballard and Charlie Coyle. The coaches guided their teams to an exciting match up - the perfect cap to a memorable day. Darcy Kuemper talks about being a part of the Goals & Dreams event in Minnesota today. In the end, coaches Kuemper and Pominville were victorious as Team Black pulled out a win over Team White. Darcy was so elated with their win that he posted a winning selfie with his fellow coach for the day to his Twitter account. Before heading home, the kids were presented with their keepsake G&D Cup trophies by their coaches. The NHLPA Goals & Dreams Anniversary Tour will make its next stop in Ottawa, Ontario on December 8th. For more information on NHLPA Goals & Dreams, please visit: http://www.nhlpa.com/giving-back/goals-and-dreams or watch the video below.